This morning's inspection of the stained lumber looked much better! I'll add some more knotholes and post a pic over on Mike's thread this evening, then you can let me know what you think. Michael/Alan, I put in my knotholes regardless of the type after graining and staining as I like to selectively pick out the boards I want to put knotholes in based on their texture and color. I also like to hand detail the knotholes both in color; either with the same stain as the boards or a bit darker with either AI or other chalk colors, and texture detail. Now you see why I'm a bit slow! This is just how I like to do it and by no means reflects how to do it. The holes on O'Neills Main Building are very small and very simple to do compared to the larger "toothpick" holes which I'll be doing some on the Welding Shop. The toothpick knotholes and saw blade banding are certainly not required but are recommended to be tried as Brett has developed these techniques over years of modeling experience and he knows what looks right for the particular application. I love how Brett introduces new detailing techniques and I just have to try each and every one and work at it until I feel I have perfected it to my modeling expectations. Knotholes can be done before or after staining however you will have to detail the knotholes to blend and highlight the freshly exposed wood if done after. Saw blade banding ideally should be done before staining as the technique will expose small amounts of fresh wood that would have to be dealt with and would be difficult to blend effectively after staining. Ken, I'm really enjoying this build. I can't wait to get the O scale version. This is one of Brett's best designs and that comes with a lot of competition. As has been said here before, the quality of your modeling is outstanding. I'm learning with every post. I know this has been asked and answered before but if you wouldn't mind describing the saw banding technique. Thank you for taking the time to post every step of this build. I'm kind of wondering about toothpick knotholes. I saw somewhere that using broom straws might be better for us HO scalers than toothpicks. Maybe on larger boards later I'll try it. Did saw blade banding come from the Loco & Service shop build? Steve, Thanks much appreciate that. The saw banding technique is outlined by Brett on page 52, Check Box #4 of the O'Neills Fabrication Manual "To simulate saw blade banding hold a single edge blade perpendicular or nearly so over the face of a board then lightly stab at the board. Don't press too hard or you will cut the board. Keep the marks close together varying the angle and length of the banding from board to board for variety"
Alan, I like using toothpicks for my knot holes as it allows you to vary the size of the knot depending on how far you stick the tooth pick in and how big your initial hole is. broom straw tends to just give you one size. I sharpen the end of my toothpicks with sandpaper first to a fine point which is even smaller than a broom straw. Also when you cut your toothpick off it will "crush" just a bit giving a less than perfectly round knot which is ideal. Broom straw...not so much. One important consideration is where to apply extra details like small toothpick knots or saw blade banding. As I outline in the manual, the main building, addition, and tower do not include these extra wood details but the welding shop does. This creates an instant age difference and adds to the overall narrative. Of course it's a personal choice but to add these extra details to all the structures dilutes its effect and visual impact. With the subtle variance in the colors and all the wonderful textures, you have put a tremendous amount of personality into this building. It's hard to believe you've worked all that into an HO structure. Well done! Can't wait to see what's next. Thanks for explaining the saw banding technique. I plan to use it on my warehouse structure. Sure looks good. You did an impressive job of weathering the base board in pic 1. Great job simulating mossy/lichen spots. That is some fantastic work Ken. Outstanding Ken, until you put your hand in there its so hard to say this isn't a larger scale. It always amazes me how meticulous you are, but that's what makes you one of the greats. I also love that Brett has developed techniques that are indiscernable between scales, Your HO results using Bretts techniques are better than 95% of the other O scale stuff out there. Very impressive work. Cant wait to see your next post, really enjoying this build of such a great kit. Looks really good. I thought you said you were slow! I'm still graining & staining! That's some solid construction, Ken and your peeling paint effect is outstanding! Love the light peeking out of the missing panel of the door in the last picture. Steve, Thanks much and look forward to seeing how you do with the saw banding. I haven't done much of that so just passing along the technique from the manual which will yield great results. Bryan, appreciate that and I really enjoy this part of the build. Yea, you like my aged diorama base? Thought that might get a few comments. Thanks much Brett. I kind of like an occasional picture with a hand for scale for just the reason you mentioned. Your kits are so good you do forget their scale. I took this idea from watching your Video Walk Through in which you, at one point, reach in and remove the fence and you realize this is a model! Dustin, nice hearing from you and thanks. Having a ball with this kit. Karl, appreciate that my man and nice having you wade in here. Once the Main Building is in place on the diorama base I'll finish some minor detailing here. You are so right how Brett's kits bridge the scales seamlessly. Re-loading for the work on the Tower walls and details...Ahh...I see it Karl...good catch on the fresh area on that board. Super work again, Ken. Now if you will please go back to page 8, April 25 post, and tell me what tool you used to grain the 1:1 boards the wall is sitting on. That's some over the top graining! Seriously, you're doing a wonderful build and I'm looking forward to starting this one. 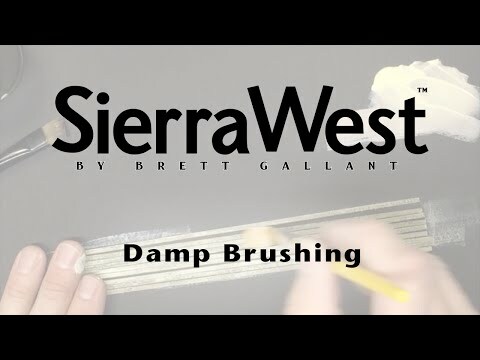 Check out the Craftsman Kit University videos, Brett has added one for a damp brushing effect. Yeah, I watched it last night and did my boards over again! Looking real good Ken. What will the detailing be please as I could still do some improvements on mine. Appreciate that Michael. Once the walls are together and the main details completed such as the vents, sign, doors, windows etc..I will then go back and create highlights, accents, shadows, etc. with selective use of chalks. A bit of discoloration where water would run down around windows and doors, along the edges where siding meets trim, that kind of thing. Here is the same walls with the window and door openings trimmed out and the right and left walls with the full length trim on each side. Again, careful attention to fit and finish here is important. Some close up pictures of that detailing , when you get there, would be a great help please. Thanks Wes, nice hearing from you. Tower walls with doors and windows installed. A few more details to add here and the walls will be ready to go together. Family photo of the Tower walls. OK Michael, here is a close up of the details I performed on the right wall. Notice the slight darkening along the edges of the windows and doors that appear as shadows or weathering. Also the slightly darker vertical streaks at the corners of the window trim. This is all done in a very subtile manner or it doesn't work. Rear wall with some great looking freight doors. Love the look of the transom and the slightly open door...wonderful design. Left wall with its third story window. Front wall with the door trim not installed until after the walls are together. A really cool staircase feeds off this door landing down to the elevated door on the Main building. Again, great design concepts at work here...well done Brett! Oh...the wall edges where the walls join will be dealt with after the walls are together. Notice the exposed wood here and there along the edge in the above picture. This will all be detailed once the walls are fitted up. Thanks Ken I shall see if I can emulate some of these. I think I'm going to change the door on the right wall to an open in configuration which would be more prototypical in this situation and I think would look better. Will update with a picture once completed.